Recently, Cute W and I were both feeling crabby. Cute W sent it because he was “on the red train” at work. This is a family code which we adopted at least fifteen years ago after some conference my father attended. If you’re feeling pessimistic and irritable about everything, according the presenter, then you’re “on the red train.” The idea is that if you’ve got pessimistic momentum going, anything that happens will piss you off. You have to disembark from “the red train” and “get on the blue train.” When one of us is in a full-on rant, occasionally the other spouse will say, “Umm, honey? You really need to get off the red train.” So Cute W sent the link as a little reminder that we had to buck up and get back on the blue train. After watching the video, I decided that I could use a little attitude adjustment, which led me to the library, where I checked out The How of Happiness: A Scientific Approach to Getting the Life You Want by Sonja Lyubomirsky and The Happiness Project by Gretchen Rubin. The How of Happiness sounded a bit more self-helpy than what I customarily read. For some reason, I’ve always been a bit snobby and eye-rolling about self-help books, which is silly, since I am such a frequent skimmer of parenting books, which are basically. Anyway, I didn’t read it cover-to-cover, but the fun part about The How of Happiness is that it includes little quizzes, one of which assesses what kind of happiness activities are worth doing for you personally, based on the things that you’re naturally inclined to do, either because you know you’d like a change or because it fits into your lifestyle and preferences. Then, you can choose the two or three activities that are most likely to make you a happier person. Like a combination of a fun magazine quiz and a Choose Your Own Adventure book. Except, instead of it being Cosmo or Glamour, the quiz would be more like something in Oprah magazine. Wait, does Oprah even do quizzes in her magazine? Holy crap, she does! There go the next three hours of my life! These rang true for me. I’m absolutely happier when I’m working out regularly, and I frequently smile as a prod to feel happy. If you’re a regular reader, you know that I’ve been trying to work on friendships because I spend quite a bit of time alone. And I like the idea of cultivating gratitude. I think I’m pretty awful about over-thinking and social comparison or, if I’m not awful, I’m hyper-aware of it and I struggle to contain it (like my recent Bad Mama rant). Coincidentally, at about the same time that I was mulling these various self-improvement goals, I heard from a lovely woman named Monique from Daily Feats. People send random things to the Capital District Fun email all the time. They want to write guest posts, or they want to coach me on Search Engine Optimization, or my personal favorite, a guy who wanted to pay me $75 to work a link to a liposuction site into one of my posts! Ha! Like I’d ever talk about liposuction in any way that was full of eye-rolling and general disparagement. Occasionally it’s something worthy, like bread from All Good Bakers or a giveaway that you guys would actually want. So, I like DailyFeats. It’s designed to “help people reach their goals through small, positive steps.” I took that quotation from the website. You can come up with a list of tasks to do for the day. Except that they call them “feats,” because doesn’t that sound much better than a task? Except instead of, say, juggling while riding a unicycle, you’re doing something like remembering to drink plenty of water each day. As you check things off your list, you accumulate cute little badges. More importantly you earn points that you can use to get gift cards or make charitable donations. So if you keep up with it, you can help others by helping yourself. This is appealing, too, and it reminds me of a Radiolab podcast I listened to about a woman who struggled to quit smoking for years until she resolved that if she started smoking again, she’d write a fat check to the KKK. The notion was so appalling that it motivated her to finally quit for good. So a little external motivation is helpful. If you want, you can ask the DailyFeats folks to remind you to do something. I get a daily email reminder, and then I usually just leave a tab open on the computer to check off a feat if and when I do it. Then I get a little “good job” message and some more points. I like that they’ll remind you, but they’re not quite as relentless as some other sites I’ve heard about (like Fly Lady or Spark People). Your can just use it as a sort of personal “to do” list, or you can use it as a social network and befriend people, encourage them, or make comments. They also have special challenges, which are groups of feats associated with a certain goal, and if you complete a challenge you get more points. So, for example, a week-long running challenge includes running, stretching, and hydrating. I did. . . okay. Exercise was something I already tracked, and so moving it to DailyFeats wasn’t particularly life-changing. I thought the kindness thing would be easy because . . . I’m a nice person. But I held myself to a fairly high standard. Like, I’ll count a bigger volunteer thing (like giving blood or spending all day at the school field day), but regular volunteer gigs don’t count. And bringing cookies to an event where we’re supposed to bring something doesn’t count, although an entire meal for another family would. I thought I could always write a thoughtful and kind note to bring up my weekly average, but this is easier said than done. My writing was an unmitigated disaster. The plan was that any blog or KidsOutAndAbout writing wouldn’t count, because I’m trying to make myself do other things. Beyond that daily stuff, though, I just sucked. I think I really need some more external deadlines. Quick, somebody assign me something, would you? The one huge success was gratitude. 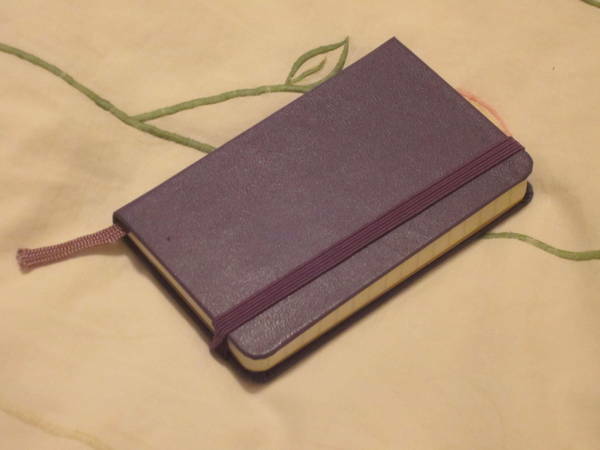 I bought myself a teensy purple notebook and I write three (sometimes four) things each day for which I am thankful. I actually really love this new routine. During the day I’ve found that I am, like Achor said, “scanning for the positive” so that I’ll have things to write in the evening. It’s a lovely little review ritual each night just before sleep. And it functions as a very small journal, which is great. I’ve had a journal off and on for more than 30 years, but the blog has mostly replaced it in recent years. Which is alright, except that I don’t feel comfortable talking about absolutely everything here (even though sometimes it seems like I do), so it’s good to have it. But I do think that it’s a good tool. In fact, now that I’ve tried it for a couple of weeks, I think I’m going to change what’s on my list of Feats. I might make a new list of family things to do for the summer. And in fact, if you want to try it, Monique at DailyFeats says that you can put in the promotion code CapitalDistrictFun100 to get 100 points for doing nothin’ except signing up. I actually love having a “to do” list. I’ve realized that having a “to do” list waiting for me in the morning is one of the best predictors of a great day. I’m just more efficient, and I feel accomplished and resourceful and motivated every time I cross something off. Which is interesting, because both of the books talked about this–the How book talked quite a bit about how having goals makes us happier, and in The Happiness Project, she argues that tracking her progress was essential. And I like that DailyFeats offers cute little manageable “feats” with adorable badges, even though I also get quite a bit of satisfaction from crossing things off the list with pen and paper. How about you? Am I sounding OCD about this? Are the rest of you running any sort of self-improvement campaigns? Or do you ever have to work on getting a better attitude? I just saw Gretchen Rubin give a plenary speech at a conference I attended. She is just as you say in person–self-deprecating, encouraging and non judgmental, which is what one would want in a self help-y setting. I very much enjoyed it. She has a new book coming out in the fall that focuses more on happiness in the home, which I imagine will be even more relevant to we moms. @Elaine, Yeah, I will be on that new book, too, I think.